Habit: Perennial herb, subshrub, 2--5 dm, generally dense-appressed or -spreading-silver-hairy. Stem: prostrate to decumbent, not weak. 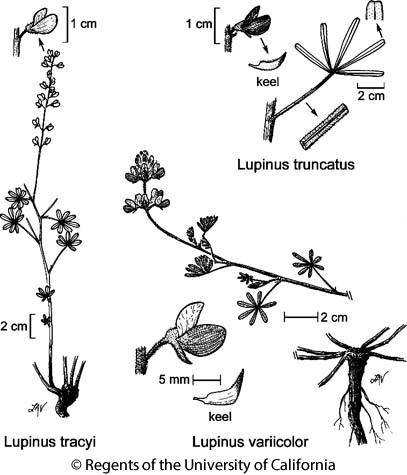 Leaf: cauline, often appearing clustered near base 1st year; stipules 7--8 mm; petiole generally 4--10 cm; leaflets 6--9, 20--35 mm. Inflorescence: 6--15 cm, flowers +- whorled or not; peduncle 4--12 cm; pedicels 4--12 mm; bract 4--7 mm. Flower: 11--16 mm; calyx upper lip 7--8 mm, 2-toothed, lower 8--9 mm, generally entire; petals white, yellow, rose, or purple, often on 1 pl, banner back glabrous, spot 0, keel upper margins ciliate, lower glabrous. Fruit: 3--4 cm, dark, hairy. Seed: 7--9, 3--4 mm, mottled dark. Ecology: Coastal terraces, beaches; Elevation: < 500 m. Bioregional Distribution: NCo, n&c CCo. Flowering Time: Apr--Jul Note: Doubtfully distinct from Lupinus littoralis. Citation for this treatment: Teresa Sholars & Rhonda Riggins 2012, Lupinus variicolor, in Jepson Flora Project (eds.) Jepson eFlora, http://ucjeps.berkeley.edu/eflora/eflora_display.php?tid=80625, accessed on April 23, 2019. NCo, n&c CCo. Markers link to CCH specimen records. Yellow markers indicate records that may provide evidence for eFlora range revision or may have georeferencing or identification issues. Purple markers indicate specimens collected from a garden, greenhouse, or other non-wild location.